The R&S®FSVR combines a full-featured signal and spectrum analyzer with a real-time spectrum analyzer. Therefore, it provides all the capabilities and features that modern T&M instruments of this kind have to offer. In real-time operation, the R&S®FSVR seamlessly measures and displays the spectrum in the time domain with a span of up to 40 MHz. As a result, it captures every event for analysis, no matter how brief that event might be. The R&S®ESR is an EMI test receiver for the frequency range from 10 Hz to 26.5 GHz and complies with the CISPR 16-1-1 standard. It measures electromagnetic disturbances with the conventional stepped frequency scan or – at an extremely high speed – with an FFT-based time domain scan. At the same time, the R&S®ESR functions as a full-featured, powerful signal and spectrum analyzer for lab applications. Featuring real-time spectrum analysis capability with a wide range of diagnostic tools, the test receiver also enables detailed analysis of disturbance signals and their history. The R&S®ESR comes with clearly structured menus and an intuitive touchscreen, making it very easy to operate in any mode. Setting up an EMS/EMI test system is a very complex process requiring significant investment. The steps involved include custom planning, design, installation and configuration of various components and standalone instruments as well as the RF-shielded anechoic chamber. Rohde & Schwarz is now offering the standardized R&S®CEMS100 test platform that is the company’s first flexible, reliable and cost-effective off-the-shelf solution for radiated EMS measurements in line with IEC/EN 61000-4-3. 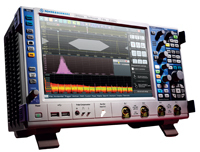 In the basic configuration, R&S®RTO oscilloscopes offer 50 Msample acquisition memory per channel. Applications such as seamless acquisition of long pulse or protocol sequences often require even deeper memory. The R&S®RTO oscilloscopes’ acquisition memory can be extended up to 2 Gsample. Signal processing in the ASIC ensures a smooth workflow even with deep memory. Excellent amplifiers from 9 kHz to 6 GHz with high power density. The R&S®BBA150 broadband amplifier family generates power in the frequency range from 9 kHz to 6 GHz. The compact amplifiers are rugged and feature high availability. The R&S®BBL200 broadband amplifiers are ideal for applications requiring high RF power. The R&S®BBL200 broadband amplifiers generate 3 kW, 5 kW and 10 kW of power in a frequency range from 9 kHz to 225 MHz. They are liquid-cooled, solidstate, highly rugged, quiet and efficient. Precise monitoring of all runtime parameters ensures maximum robustness and reliability. For more than 80 years, Rohde & Schwarz has stood for quality, precision and innovation in all fields of wireless communications. The privately owned company is strategically based on five pillars: test and measurement, broadcast and media, secure communications, cybersecurity, radio-monitoring and radiolocation. The electronics group, headquartered in Munich (Germany), has a global presence and is among the world market leaders in all of its business fields.